Tag Archive | "Connor Ellison"
Clyde Dykhouse and Colton Moore getting ready in the field. 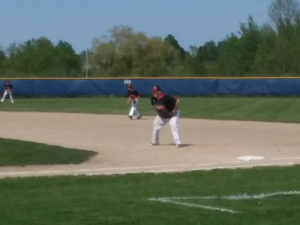 On May 17, the Cedar Springs Red Hawks JV baseball team traveled to Big Rapids to take on the Cardinals in a double header. In game one, Connor Ellison pitched a great game, striking out 7 while only walking 1. One costly error in the final inning cost the Red Hawks the victory as they lost 5-3. The Hawks scattered 7 hits throughout. Colton Moore, Willy Zain, Kyle Wise, Clyde Dykhouse, Dylan Greenland, Lucas Secord and Dylan Knauf each contributed. In game two Colton Moore and Dylan Knauf divided the pitching duties in the 7-5 victory. The Cardinals came out pounding the baseball, but the boys threw strikes and were able to keep them off balance. The defense made a few great plays as well. Knauf and Zain led the team at the plate with two hits apiece. Wise, Dykhouse, Jeremy Campione and Trenton Snoeyink each had hits as well. The JV are now 12-11-1 and will wrap up their season with a three game series with Greenville, followed by a conference tournament next week. Freshman Trenton Snoeyink earned the save for the JV Red Hawks baseball team over Newaygo. The JV baseball team improved to 3-1 with a nail-biting victory over Newaygo on Wednesday, March 28. 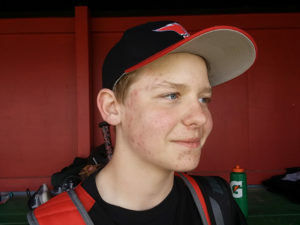 Once again sophomore Caden Vandenberg led the team in hitting with two singles and three RBI. Trenton Snoeyink, Dylan Greenland, Jeremy Campione, Willy Zain and Connor Ellison each added a hit as well. The Red Hawks were tied 3-3 going into the 5th inning. After an Ellison single to start the inning, Clyde Dykhouse hit a rocket at the third baseman, causing him to misplay the play, leaving runners at first and third. The Hawks proceeded to score 4 runs with timely hits by Greenland and Vandenberg to take a 7-3 lead. In the sixth, Newaygo managed to put together a collection of hits. Those, accompanied by a pair of Red Hawk errors, got them to within 7-6. In the seventh inning, freshman lefty Trenton Snoeyink went out to the mound to try closing the game out. He walked the first hitter, then proceeded to catch him stealing second with a well-timed pick off move. Trenton then struck out the final two hitters to end the game and earn the save. The JV will play next after spring break at home on Wednesday, April 11 against Forest Hills Northern and will play Northern again on the 13th on the road.